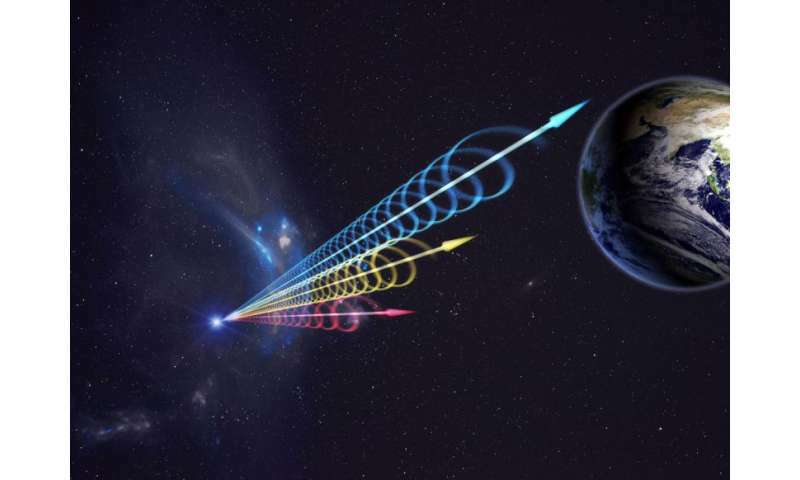 The recorded data—a total of 40 terabytes—created a substantial analysis challenge, which was made even more difficult because the otherwise short, sharp signal of an FRB becomes "smeared out" in frequency by its journey through space. The team—primarily researchers with cosmology backgrounds—used this software to conduct an initial pass of the GBT data to flag any candidate signal. This yielded more than 6,000 possible FRBs, which were individually inspected by team member Hsiu-Hsien Lin from Carnegie Mellon University in Pittsburgh. His analysis winnowed the field until only one candidate remained. Further analysis of the signal reveals that it also passed through two distinct regions of ionized gas, called screens, on its way to Earth. By using the interplay between the two screens, the astronomers were able to determine their relative locations. The strongest screen is very near the burst's source—within a hundred thousand light-years—placing it inside the source's galaxy. Only two things could leave such an imprint on the signal, the researchers note: a nebula surrounding the source or the environment near the center of a galaxy. FRBs are an important record of the space through which they have passed. Information could have been written by ( interposing ) ionisation on their path. Objects in the FRB path will re-radiate to be received years later these smaller signals could still be received as a high gain antenna will know where to point and the dispersed re-compression will provide gain.